Click on this picture of information on the left to see it in a NEW and LARGER window! This is from the fine folks at WGN in Chicago. Tom Skilling and his crew do an excellent job forecasting the weather. 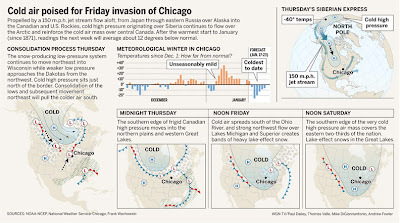 Check out this post about the brutally cold air that will invade the Windy City. Wow, that's quite a blast coming! I am sure it will be felt all the way down to the Gulf. By the way, the link does not seem to open a new window, at least in Firefox. Could you 'right click' on it and then open it in a new window or tab? Yes, that always seems to work with any image.